For most retailers, the 2018 holiday shopping season will present their biggest opportunity of the year to engage with customers. It will also represent the bulk of their annual sales. As a result, this time of year is crucial for retailers to achieve success. With that in mind, current conditions make this holiday shopping season look positive for retailers. Here are five things that retailers need to keep in mind before heading into the holidays. From what we’ve seen, customers are excited about shopping this year. Brick-and-mortar sales will grow 1.4 percent and online growth is expected to reach 14 percent, according to Forrester Analytics: Online Holiday Retail Sales Forecast, 2018 (U.S.). Various studies also show that the average U.S. consumer will spend more during the upcoming holiday season, jumping from $1,226 per consumer to $1,536. Deloitte’s annual holiday economic forecast looks great for retailers as well. Consumers seem confident about the economy, their household financial situations, and their spending plans for the upcoming holiday season. Deloitte’s consumer survey shows online spending continues to grow and is expected to account for 57 percent of all purchases. Also, Deloitte’s research notes that shoppers are enthusiastic about the holiday season and remain price- and value-focused. Based on the report, retailers are in a good spot to influence where consumers shop this year as many shoppers are entering the season undecided. Consumers are doing their holiday shopping earlier based on a study by Bazaarvoice. An early Thanksgiving helps spread the holiday shopping theme to consumers. Thanksgiving is as early as it can be this year (Nov. 22) which could prove helpful to retailers. Sixty percent of consumers say they begin their holiday shopping before Thanksgiving . This is particularly important this year because there will be 33 days between Thanksgiving and Christmas. Retailers have that much more time to fully engage consumers this holiday season. Although spending will increase this holiday season, retailers must be conscientious when it comes to identifying their best customers who are most likely to spend the most. It appears that consumers look forward to spending early for their holiday shopping . This fact, combined with the Thanksgiving retail shopping period that includes Black Friday and Cyber Monday, means brands need to be prepared for this critical holiday shopping period around Thanksgiving. Consumers are confident about the economy for several reasons. National Retail Federation President and CEO Matthew Shay cited some of these factors . “Thanks to a healthy economy and strong consumer confidence, we believe that this holiday season will continue to reflect the growth we’ve seen over the past year,” Shay noted. Holiday sales in 2017 totaled $687.87 billion, a 5.3 percent increase over 2016 and the largest increase since the 5.2 percent year-over-year gain seen in 2010 after the end of the Great Recession. All of these strong macroeconomic factors have contributed to one of the best consumer discretionary spending environments in years . Consumer confidence in the economy is a powerful thing during the holiday season, which places retailers in an ideal situation to enhance engagement and retention levels. Retailers can take advantage of the favorable economy and positive consumer sentiment through customer insights data during the holiday season. Preparation for the holiday season is imperative for retailers. One under-the-radar element of holiday preparation for retailers should be website performance. Whether it is a brick-and-mortar store or an ecommerce site, online presence marks the essence of every business strategy today. Checking website performance, load time, application performance testing, application load test, and much more are quickly becoming inevitable for commercial success. All these factors play a vital role, especially during the high-pressure holiday season when every small or big portal is trying to grab maximum profits from the market. During the holiday season retailers need to ensure that store associates are well versed and excited about the loyalty programs they will be promoting. The holiday season is a great time to engage and create new customers, but what happens after that? One of the strategies a retailer can use to achieve this goal is a loyalty program. There are thousands of loyalty programs out there, but consumers are drawn to ones that are simple and offer real value. A new study shows that 40 percent of customers who refrain from signing up for loyalty programs do so because the value of being a loyalty member is not worth the time, money, or effort of signing up. And for those who sign up, 76 percent do so to qualify for special promotions. Retailers should take note of these statistics and evaluate special offers for loyalty members to ensure that their promotions are competitive and offer value. Effectively leveraging a loyalty program during the holiday season can go a long way toward retaining customers in the long run. That customer engagement during the holiday season should continue in the New Year to bolster your consumer relationships. Loyalty program signup is important throughout the year, but it takes on added importance and relevance during the holiday season. If brands listen to their customers, identify their pain points, and meet their expectations, they can build solid two-way relationships that extend well beyond the holiday season. Given the fact that consumers are upbeat about spending in a strong and vibrant economy, retailers can and should take advantage of the early Thanksgiving and make this holiday season a memorable one through increased customer engagement, more promotions around value-driven loyalty programs, and ensuring that store associates are proficient in your key brand messaging. Creating memorable moments is a huge part of the holiday season. Focus on your customers and enjoy a Happy Holiday Shopping Season! Doors at many Macy’s, Sears and J. C. Penney stores may still be open, but some of the jobs they once supported are starting to vanish. General merchandise stores shed 34,700 jobs in March, the government announced Friday, the single most disappointing figure in a generally disappointing jobs report. After hitting a low point during the recession in December 2009, the retail sector has reliably been churning out more jobs. Though the Labor Department’s monthly employment summary provides only a snapshot of the labor market, this is the second month in a row that retail payrolls have registered substantial losses — a possible sign that larger structural changes are in the works. The vitality of the retail sector has been muscled out of the spotlight lately by a focus on better-paying manufacturing jobs, which President Trump sees as crucial to the revival of the middle class, particularly in the Midwest and the South. But retail outlets still employ millions of Americans and serve as an entry point into the labor force, especially for those with less education and fewer skills. Remember that while General Motors was once the single largest employer, today Walmart is. 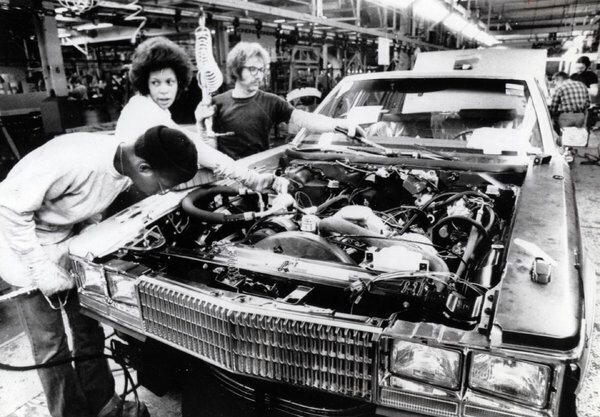 Workers in the 1970s at a General Motors plant in Detroit. The automaker was once the single largest private employer in the United States. Yet even Walmart is having to contend with a sea change in the way people shop. The company, for instance, has been closing smaller stores in rural areas, according to Barbara Denham, a senior economist at Reis, a real estate data and analytics firm. Jack Kleinhenz, the chief economist at the National Retail Federation, does not discount the magnitude of the transformation that is occurring in retail, but cautioned that the monthly job figures are also highly subject to temporary vagaries. “One of the challenges we have at this time of the year is the quirkiness of seasonal forces,” he said. An unexpectedly warm February and snowy March and the late arrival of Easter could have elbowed the numbers in an uncharacteristic way. Most shopping is still done in person rather than online, but shopping patterns are shifting. Ms. Swonk mentioned research that shows consumers like to buy online but return things to bricks-and-mortar stores. E-commerce may cause a drop in retail jobs, but a rise in warehouse, distribution and transportation jobs. At the same time, consumers have not only been changing how they shop, but what they buy. Ms. Denham noted that while the entire retail sector ended up down nearly 30,000 jobs, the restaurant industry showed a gain of 20,000 in March on top of steady previous growth. About 154 million shoppers made purchases at stores or on e-commerce sites this holiday weekend, the National Retail Federation reported Sunday, a bump up from the 151 million people who last year participated in the annual barrage of Black Friday deals. And though it is encouraging for the retail industry that more consumers opened their wallets this time around, it wasn’t all good news: Average spending per person was down to $289.19 from $299.60 in 2015. Matt Shay, the chief executive of the National Retail Federation (NRF), attributed the decline in spending to just how deep and broad the discounts were over the four-day weekend. While the promotions offered during this period were probably preplanned and thus baked into the retailers’ sales plans, it could prove a troublesome dynamic for them if ultra-deep discounts end up being needed all season long to get people shopping. But other factors could have contributed to the decline in per-person spending: Retailers have been spreading their Black Friday deals out over a longer stretch, so it’s possible that many people pounced on offers several days before Thanksgiving even arrived. And NRF’s survey found that about 122 million people plan to shop on Cyber Monday, up from 121 million last year. So perhaps some consumers are holding out for the fresh batch of deals that will arrive after the weekend comes to an end. The survey results reflect the increasing importance of e-commerce in the retail landscape. This year, about 108.5 million people shopped online over the holiday season, compared with 103 million last year. Meanwhile, the number of people who shopped in stores fell to 99.1 million from 101 million last year. Indeed, other data released this weekend offers evidence that online spending was strong on Thanksgiving and Black Friday. Adobe, which analyzed 22.6 billion visits to retail websites, reports that a record $3.34 billion was spent online on Black Friday, up 21.6 percent from the previous year. Sales on Thanksgiving Day were up 11.5 percent to $1.93 billion. Adobe’s research found that top-selling items included iPads, Samsung 4K televisions and toys such as Lego Creator sets and the Barbie Dreamhouse. The NRF had earlier projected that the retail industry would see a 3.6 percent increase in sales this holiday season over last year. That would be significantly better than the 3 percent growth registered in 2015. The trade group’s chief economist, Jack Kleinhenz, said Sunday that he believes that prediction “holds up pretty well” right now, even as some have asked whether the surprising election results might have altered consumers’ mind-set. Experts say that in a presidential campaign year, we typically see that the election serves as a temporary distraction, with shoppers getting their gift-buying started a little later than they might otherwise. NRF’s survey seems to reflect that dynamic: About 23 percent of respondents said they hadn’t started their holiday shopping yet, compared with 19 percent last year. And a smaller share of people have finished their holiday shopping. This year, just 9 percent of shoppers have done so, compared with 11 percent last year.